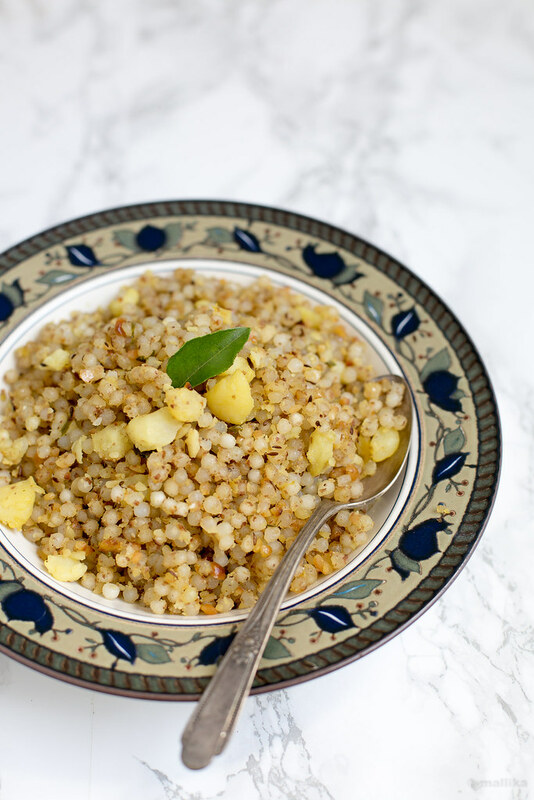 Sabudana Khichdi is a very authentic signature Maharashtrian dish. Although this is not very commonly known to many people of other regions/states, one is bound to fall in love with this once introduced. It's commonly made during the fasting days. I remember my paternal mother would fast every Monday and Thursday on a weekly basis. The fast was not meant to starve, but to refrain from consuming wheat, rice, pulses and a couple of forbidden food items. These were days we would wait eagerly for, as she cooked the most awaited dish, Upavaschi Sabudana Khichdi. I simply loved it and I still do it to this day! During our stay in Khamgaon when dad was posted in Maharashtra, I would freak out on eating Sabudana Khichdi. We would hit the market streets on Thursdays, which was the only day when this dish along with other Upavaschi uphar was made. And that too only in one shop in the entire town! My complain was why can't this be sold more often on daily basis by more vendors. With this dish being so popular, why not sell it more? But I guess it's so commonly made in all Marathi homes that they would probably not think of buying it outside! As kids, we loved this dish and looked forward to days when mom made it. But she would resist from making this more often as we always over-indulged. Besides this, sago is heavy on stomach and not an easily digestible food. This is the reason why it is eaten on fasting days so that it helps in beating hunger for longer time. Before leaving Khamgaon, amma picked few packets of good sago. I took some from her and attempted to make them at home... not for fasting, but for breakfast. It was a big hit, as my husband who was not particularly fond of it earlier (he tasted them for the first time in Khamgaon after all my hype) is now a big fan of the same! Wash and soak sabudana in water for atleast 4 hours. I prefer soaking overnight. The best method to get perfectly soaked sago would be to drain the water after washing sago. Soak sabudana by adding just enough water to cover them. Do not go above 1/4 inch more than sabudana level. You can sprinkle more water later if required. The sabudana should swell well. You can test them by pinching the granule between your fingertips and they should turn mushy. To the sabudana, add in crushed roasted peanuts along with salt to taste. This will help to reduce the sabudana granules from sticking to each other while stir frying. Heat the oil in a pan and add cumin seeds. When the seeds crackle, add finely chopped green chillies and torn curry leaves. Add the sabudana mixture and stir well. Leave the pan uncovered and allow the sabudana to cook till they turn translucent in color. Add the chopped boiled potatoes and cook for another 4-5 minutes. Finally add the sugar and mix well. Turn off the flame and serve hot. This is great - would point out one thing though, for upvasa, oil is not eaten, so the seasoning (tarka) is made in pure ghee. Second, for a while now, I have been making it using a microwave and that is great as the khichdi never ever turn dry or chewy as it sometimes can on the hob. 3-4 minutes are enough for the quantity above. Hey thanks for pointing out on that! This will be helpful Priya!